Conditions above 11,000 ft in Rocky Mountain National Park can always be difficult to predict. One can never be sure what to expect when traveling above timberline. Warm days at lower elevations in Estes Park can quickly turn to cold, blustery days high above Rocky. The opposite can also be true on some days as well. Fog had socked in the lower elevations of Rocky Mountain National including Estes Park this morning. High on the alpine tundra along Trail Ridge Roa the skies were clearing and the sun was making its way through the clouds. 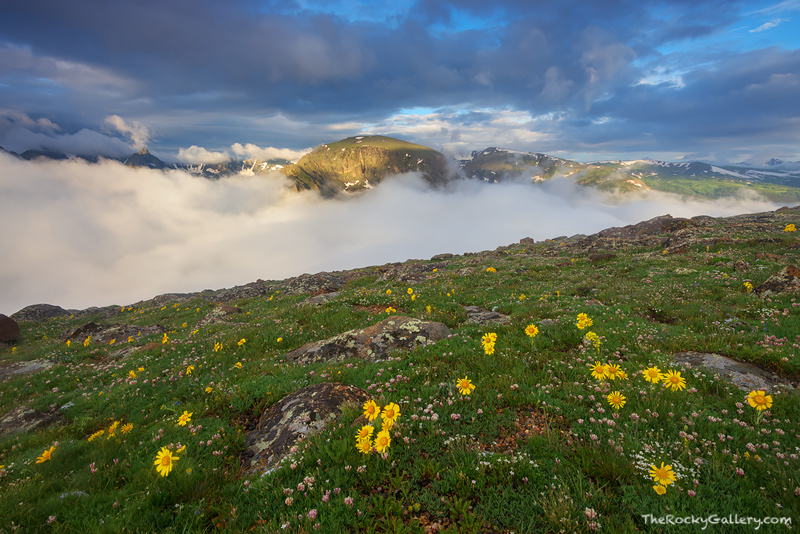 With beautiful Alpine Sunflowers blooming on the bright green grass of the tundra, fog that had filled Forest Canyon lowered enough to reveal the summits of the Hayden Spire and Terra Tomah Mountain. It was an amazing experience photographing this dynamic scene. As the fog cleared and the sun spotlighted some of the peaks, the fog from Forest Canyon would rise and fall. With the fog came the most intense and terrific smell of moist pine trees from the canyon below. Photo © copyright by Thomas Mangan.